Ole Gunnar Solskjaer’s Manchester United made it 8 wins out of 8 on Friday, as the Red Devils beat Arsenal 3-1 to proceed to the next round of the FA Cup. 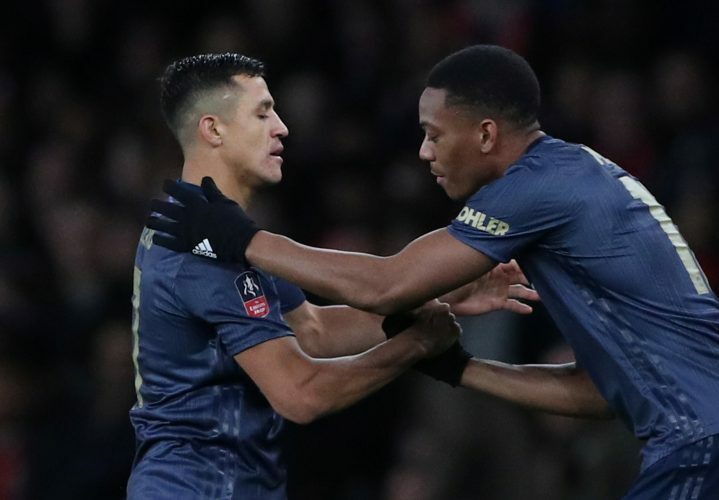 Goals from Alexis Sanchez, Jesse Lingard, and Anthony Martial got the job done for the Mancunians, with Pierre-Emerick Aubameyang’s goal late in the first half simply serving a consolatory purpose in the end. Made a crucial save early in the second half to deny Aaron Ramsey from equalizing the scores. Stopped a Lacazette shot brilliantly as well. Couldn’t have done much about Aubameyang’s close-range finish. A disciplined performance. Led the team well from the back. A confident display from the Ivory Coast international. Could have done better during the build-up to Arsenal‘s sole goal. Yet another impressive showing from the Swede. Becoming more and more reliable each game. Contributed enormously in defence as well as on the attack. A great supplement up front, especially in the second half. Shielded the back four and passed the ball well. The Serb has well and truly reemerged from the ashes since Jose Mourinho’s departure. Another sensational display by the Spaniard. His performance against the Gunners once again reinforced his leadership qualities. Captain material. Conserved his energy in the first half, only to make several effective counter-attacking runs in the second. Petr Cech’s save off his venomous shot was followed up by Anthony Martial to seal the tie. An extremely calm and composed finish by the Englishman doubled United’s lead. Was a threat all around. Emirates has truly become Jesse Lingard’s playing ground. A dream return to the Emirates for the Chilean. Took his goal expertly after rounding off the experienced Cech. Could have retained the ball better. Deployed unexpectedly on the right wing, where he performed splendidly. Bagged two assists for the opening two goals, the first of which was quite brilliant, to say the very least. Offered pace up front to stretch the Arsenal defence. Lost possession several times after coming on. Capitalised on the rebound of Cech’s save with a clinical finish. Shored things up at the back after replacing Lingard.